LONDON--(BUSINESS WIRE)--Technavio has announced the top six leading vendors in their recent global cricket equipment market report. This research report also lists 11 other prominent vendors that are expected to impact the market during the forecast period. The global cricket equipment market is growing at a steady rate. In 2015, APAC dominated the market in terms of revenue. This region is expected to retain its dominant position during the forecast period as well. In APAC, India is one of the major contributors to the market revenue. The presence of many cricket enthusiasts in the region will boost the sales of cricket equipment here during the next five years. The global cricket equipment market is highly fragmented with the presence of many competitors. The market is expected to experience a sizable rise in production capacity during the forecast period as competitors are focusing on expanding their presence in traditionally low penetrated markets. Intense competition among these players has led to the introduction of many advanced and innovative products in the market. “Market players compete on different factors including price, quality, and brand. Different companies indulge in different strategies to increase their market share. The acquisition of new brands will provide an opportunity to the leading competitors to maintain their dominance in the global cricket equipment market during the forecast period,” says Brijesh Kumar Choubey, a lead retail goods and services research analyst from Technavio. The competitors are classified as market leaders, market challengers, emerging companies, and innovators. Companies with a larger market share and greater brand equity are termed as market leaders. The challengers in the market are the ones who enjoy a sizeable share of the market but are competing with the leaders and working to become leaders themselves. adidas, along with its subsidiaries, engages in the design, manufacture, and marketing of athletic and sports lifestyle products across the world. It is considered as one of the largest sportswear manufacturers in Europe. The company focuses on developing innovative products to meet the needs of professionals and everyday athletes and consumers. Gunn & Moore and Unicorn Products designs sports equipment and apparel. The company operates as a division of Unicorn Products (a provider of sports equipment). It sells and markets a wide range of products under various brands. It caters to customers in the UK, Australia, New Zealand, and South Africa. Nike designs, develops, markets, and sells athletic footwear, apparel, equipment, and accessories for men, women, and children worldwide. Its brands include Nike, Converse, and Hurley. The company has a strong global manufacturing base to meet the needs of customers efficiently. Sanspareils Greenlands manufactures a wide variety of cricket equipment like bats, gloves, balls, body protectors, leg guards, kit bags, helmets, shoes, clothing, and other accessories. It operates through its dealers. Sareen Sports Industries manufactures cricket equipment. It sells its products under the brands TON and SS. The company exports its products globally, including Australia, South Africa, Canada, Sri Lanka, the UK, the US, and Bangladesh. Its global presence helps the company to minimize risk from any downward fluctuation in any specific region. Slazenger offers hockey, cricket, tennis, and other sports equipment. It is one of the pioneers in sports equipment and is one of the world’s oldest sporting brands. It offers all necessary items for cricket like bats, balls, stumps, clothing, guards, wickets, bags, hats, inners, markers, and other products. Become a Technavio Insights member and access all three of these reports for a fraction of their original cost. As a Technavio Insights member, you will have immediate access to new reports as they’re published in addition to all 6,000+ existing reports covering segments like engineering tools, tools and components, and unit operations. This subscription nets you thousands in savings, while staying connected to Technavio’s constant transforming research library, helping you make informed business decisions more efficiently. 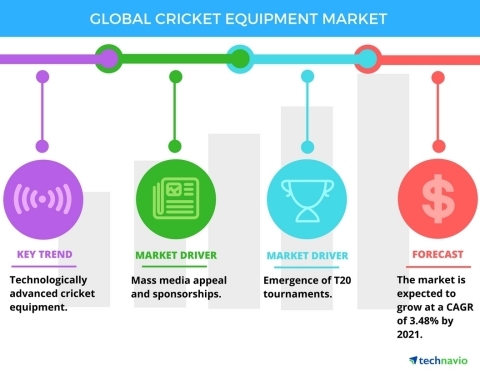 Technavio has announced the top six leading vendors in their recent global cricket equipment market report from 2017-2021.